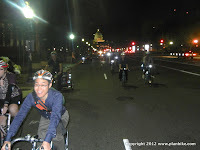 At the end of Day 2 of the National Bike Summit, the Bicycle Space bike shop hosted a ride for BikeSnobNYC to help launch his new book. The clear, balmy, weather promised to make this a memorable ride through a number of D.C. landmarks at night. The ride started off across from Bicycle Space just before dusk. It was a good turnout with a nice array of bikes and bicyclists. Group activities of all kinds are great for building a sense of community but too many attract the same demographic. To really build a true community, you've got to attract young and old, rich and poor, right and left, etc. I saw all that on this ride and see it on many rides I do elsewhere. Love that. A number of folks were showing off their cool bikes and attire. At one point the folding bikes had a fold-off: that's an amusing thing to watch. I especially liked the "dress casual" the cargo bike ride rider was sporting. A button down shirt, slacks, and dress shoes are not commonly found on cargo bike riders. Presumably, because they are gonna sweat a lot on that thing but tonight's ride was easy and he looked cool either way. I also enjoyed the houndstooth bike. Unfortunately, I never got around to finding out where the owner got that but it was super cool. The ride got off to a bizarre start just a few blocks in when a Metro Police car rushed ahead and blocked the seemingly innocuous street in front of us, with extreme prejudice I might add. There was nothing obviously sensitive on that street and it was literally one block that was off limits. That snarled the ride for a few seconds but no biggie. A few minutes later we passed the White House. The setting sun cast a long shadow of the cyclists on the stone panels in front of the White House. It was so gorgeous I wanted to spend the whole evening taking pictures there but I am glad I didn't because of all the good stuff I found ahead. I just love how relaxed I feel on these group rides no matter where in the world I am on one. I've rarely had so many warm encounters with people I didn't know. Noone knows your name but you feel like they do. Once passed the White House, it was on to the Lincoln Memorial. 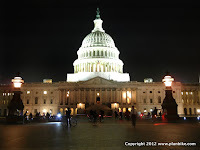 Like the White House, it has a great wide swath of carless pavement in front. If only these great swaths were all connected. Too often they are not. Instead, you find an inconsistent mix of plain car-dominated street, narrow bicycle lane, or wide but pedestrian-filled sidewalk. Nevertheless, the traffic jams from the blooming cherry blossoms did a great job of calming traffic in the area so even the streets weren't that bad (for cyclists). After cruising down by the Potomac riverfront a bit, a strange site appeared. It was yet another Metro Police car but, this time, it was helping cyclists. It pulled in front of the cars instead of us, then held the traffic at bay until we all got through. What a pleasant surprise. 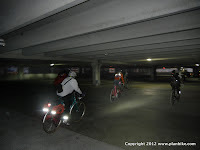 As we rode past the Nationals Park baseball stadium, the ride leaders took a counter-intuitive turn into the adjacent parking garage. The garage did have its very own bicycle parking area on the first floor which is very cool. However, there was no way we'd all fit. No worries. The ride leaders were just adding a bit of drama to the ride by taking us up to the roof for a spectacular sunset view of the stadium and surrounding area. Bicycle Space made the whole experience even better with excellent tunes and with free popsicles for everyone. These guys are obviously professionals. Once down from the roof, real darkness had set in but the light show was just beginning. We cruised down to the neighboring Yards Park. At Yards Park, an elegant new foot bridge gleamed in the night. I was told the whole area there was only recently constructed so there weren't any restaurants open yet. It is already a great place to languish. After Yards Park, it was time for the finale: the back of the Capitol. 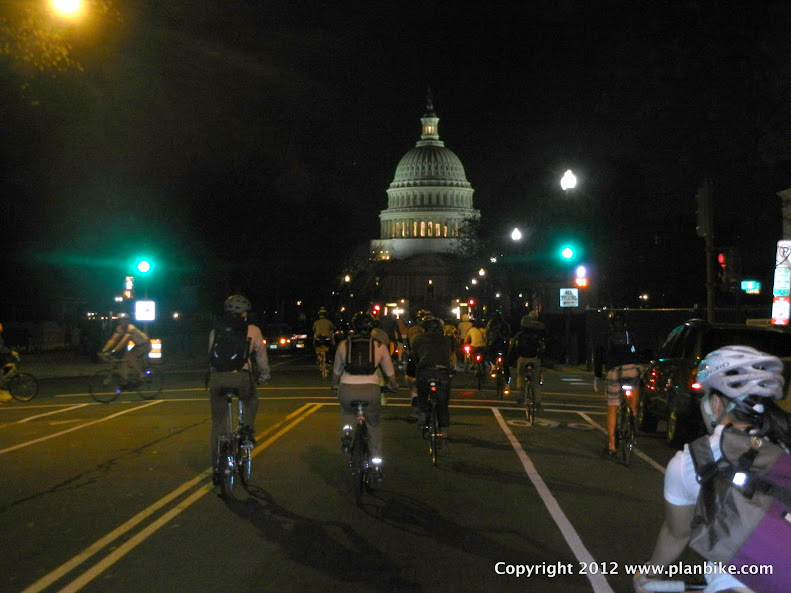 The front was a moving site in broad daylight during the Ride On Washington but approaching it at night was really spectacular. Again, the balmy temperature was perfect. You didn't care that it was getting late. Once there, folks started circling in front of it. 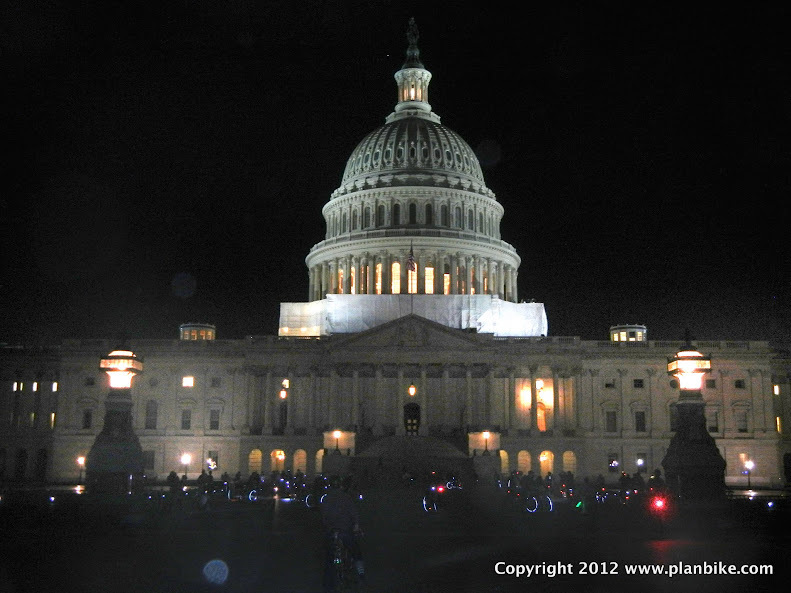 The collection of bicycle lights under the capitol created a dream-like vision. It truly beautiful and hopeful to see people spending their evenings this way instead of behind a bar, TV, or steering wheel. It was what Spaulding Gray might call a perfect moment. I was so happy to be a part of it. After that, it was time to head home. Didn't find a bike lane on this road but it was all smiles on the way, nevertheless. P.S. Special thanks to Lisa, whom I met on this ride. You were a wealth of information about cycling and D.C. It was a real pleasure to meet you. Thanks. Great post Jody! From what little I've seen of DC in the couple of days I was there last fall, it looks like a great place to get around by bike.